Exploring the world and using the senses to gather information is an important part of early science skill development. 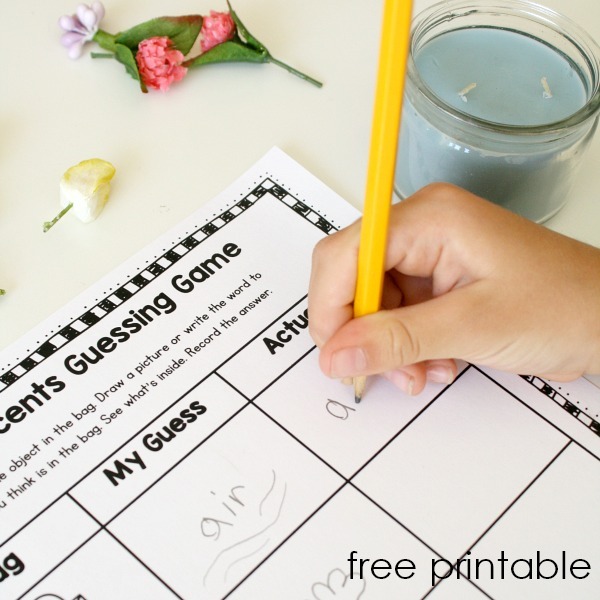 Guessing games also add an element of fun to our learning activities. 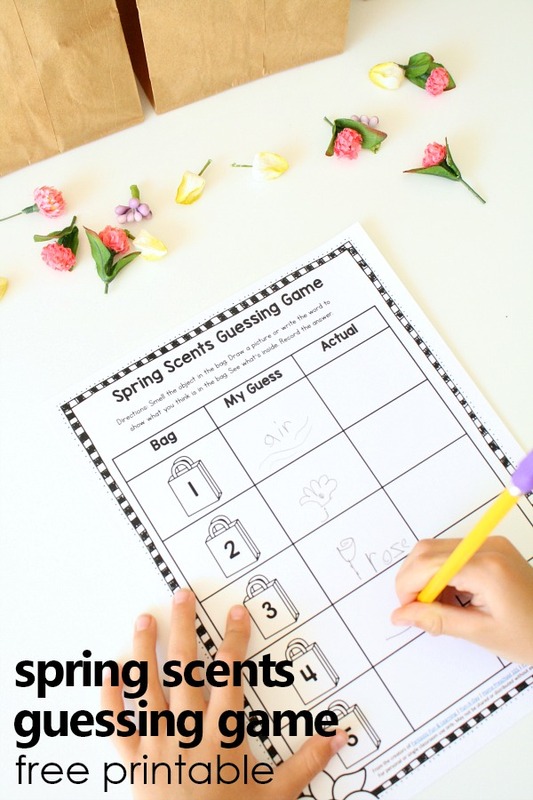 In this spring scents science activity preschoolers and kindergarteners use their sense of smell to guess spring inspired scents. 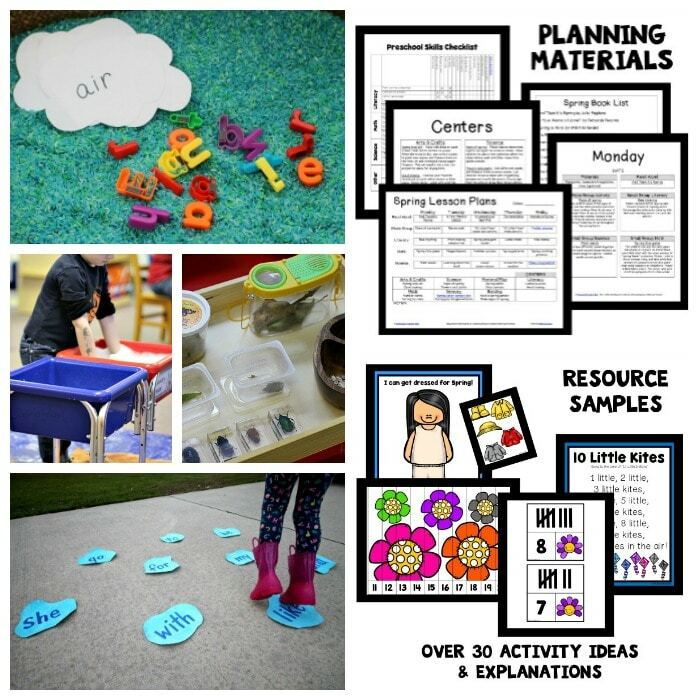 Grab the free printable and try it with your kids soon! 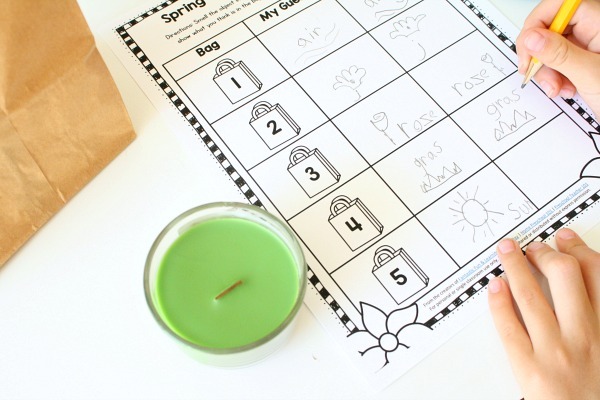 To set up the activity you’ll need to gather four scented items that represent a spring scent. There are a few options for doing this. We chose to use candles that we found at local stores. Other options you can try are using real flowers and real grass or air fresheners that represent spring scents. 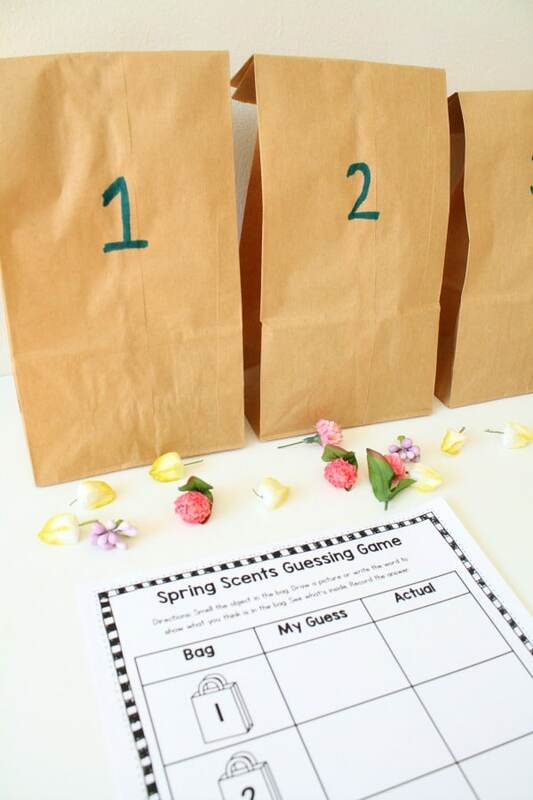 Place the items in numbered paper bags, and set them out with the free printable recording sheet and writing tools. 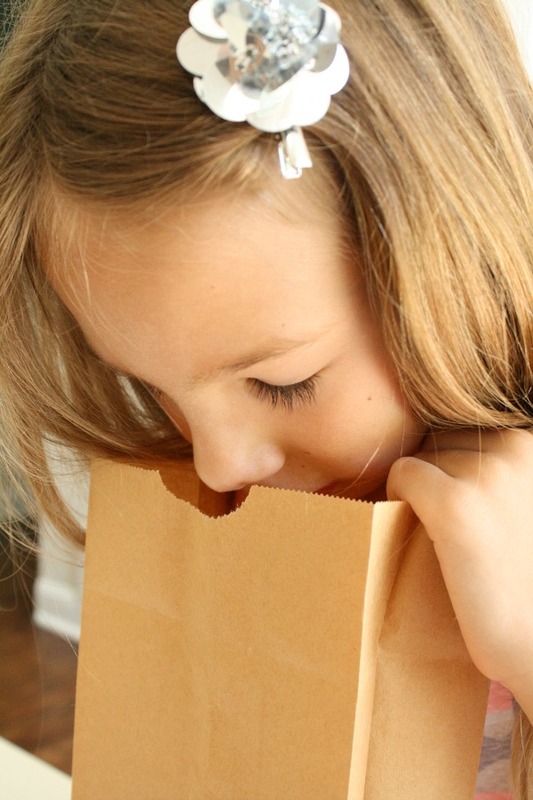 When it’s time to investigate, have kids close their eyes as they sniff the item in the first bag. If your scents are a bit obscure, you might introduce the kinds of scents kids might expect and give them words to describe them. Then they are guessing more on a process of elimination. 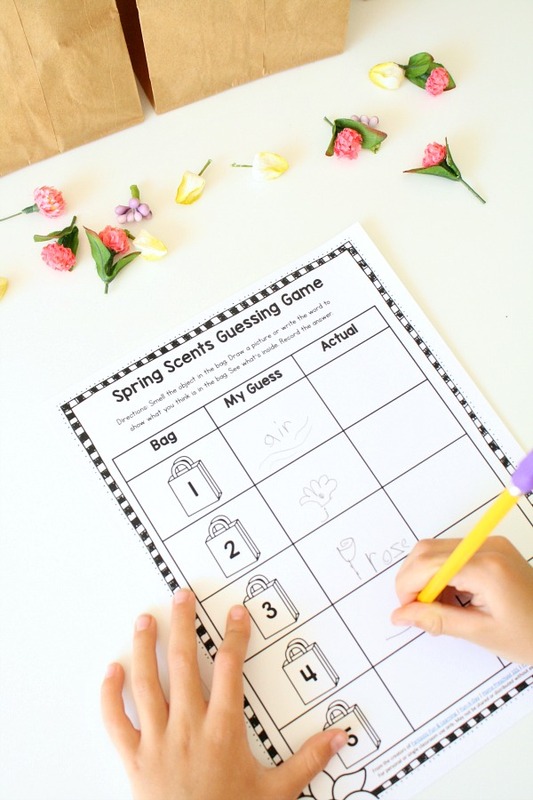 As kids sniff the items, have them draw or write what the items smell like in the “My Guess” column of the chart. Then remove the items one by one and smell them again. At this time they can either read the labels (if present) on the items, or you can tell them the scent. Finish up by recording the answers in the “Actual” column. If you’re at home (or in a location where it is safe to burn a candle), choose a candle to light each day for the next week to enjoy the spring scents.